TestingTime » UX Blog » What’s it like working as a UX researcher? Several years ago, I made the switch to UX research. And, today, I help other people do the same. My students often ask me: What's it like working as a UX researcher? I am the Lead UX researcher and instructor at UXSavvy, a company focusing on helping professionals transition into a UX career. My students often ask me: What’s it like working as a UX researcher? So I decided to write a blog post that covers the day-to-day responsibilities of a UX researcher. It also touches upon realistic salary expectations and career opportunities. As a UX researcher, your main goal is to de-risk development decisions. You do this by getting feedback from real users throughout the product or service lifecycle. Without this research, the development team can not base their decisions on evidence. So they may end up creating a product or service that is not needed. Alternatively, they may find themselves stuck, unable to continue at all because they do not know which version of the prototype to run with. Either of those scenarios can lead to unsuccessful products or services as well as create unnecessary expenses. At UXSavvy, I work on several projects, some of which are for central government. So each day is different. But since most of my projects use the agile methodology, my days usually start with a stand-up meeting. This is a ritual where the researchers, designers, business analysts, product owner, scrum master, and others each take turns updating the team on their progress and discussing bottlenecks. As a UX researcher, I have the most diverse set of responsibilities of any team member. Throughout a product or service’s lifecycle, I need to conduct a wide range of qualitative and quantitative research activities in order to understand the user’s behaviour and provide the rest of the team with actionable insights. Each project moves through four separate stages. 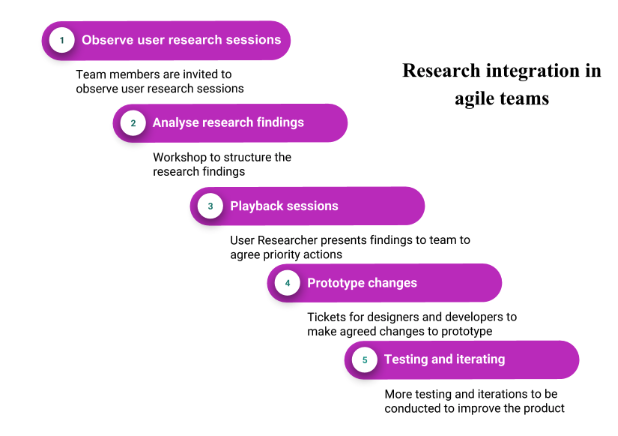 And each stage comes with its own set of tasks for the UX researcher. Qualitative methods allow researchers to uncover reasons, behaviours, and motives. For example, why (as opposed to how often) do people switch insurance companies? Researchers may also invite users to take part in co-design workshops. Co-design workshops bring users and designers together to collaborate on wireframing a prototype. The design team, too, can use the beta stage to finetune and make further improvements. These will be implemented in the final product or service. The final stage is when the product or service goes live, i.e. it is released to all users. The UX researcher’s job, however, is far from over! Just as before, at the beta stage, the users must be studied with regards to their interactions with the product or service. The difference is: now, the number of users is much higher. So you have access to much more quantitative data. Set up meetings with the team and your stakeholders. These will help you to better understand the project’s goals as well as the specific areas the research should focus on. Conduct some desk research with the team. This will help you to better understand the questions you are trying to answer and the assumptions/hypotheses you need to test. Conduct both desk research and interviews with stakeholders to gain an understanding of who the users are. Discuss and determine a realistic project timeline with the scrum master and/or product owner. Once I have completed the five steps listed above, I usually hire an agency to recruit study participants as this saves me both time and money. All I have to do is specify the profile and the number of study participants I require. For example, 5 male test users between 35 and 45 years old who have been smoking for at least 15 years. 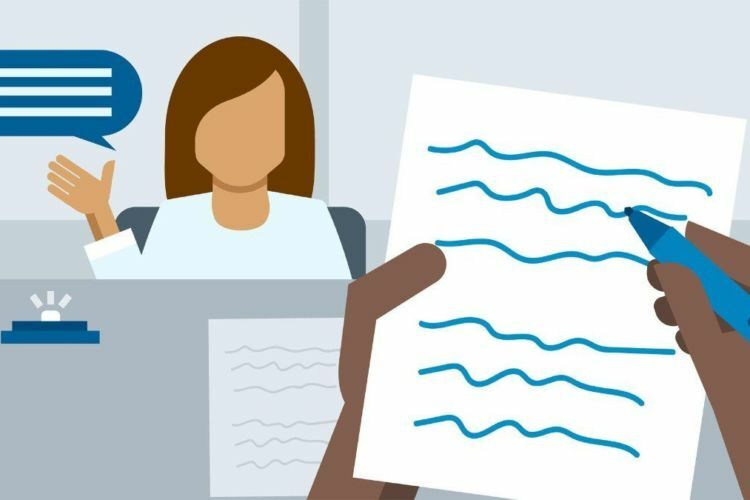 Usability tests can be conducted with low-fidelity prototypes such as wireframes as well as with high-fidelity prototypes that closely resemble the finished product. The testing should be carried out with a representative sample of users. On average, I like to conduct five sessions with five users in total. In my experience, those numbers are ideal for testing a particular version of a prototype. Usability testing can uncover pain points, i.e. features users struggle with. These insights into user satisfaction with a product or service are invaluable. 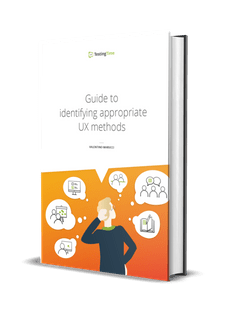 The method can also be used to validate or invalidate assumptions the design team made when creating the prototype. Before you carry out the actual usability test, it’s a good idea to pilot test your study with a colleague. This will ensure that what you are asking of the users makes sense and that any auxiliary technologies and materials you will be using actually work. A usability test with an electric torch, for example, may require a set of charged batteries. This method involves creating two (or more) versions of the prototype and getting feedback from users. This can be done at the lab. But it can also be done remotely, for example, at the users’ homes. Testing remotely has the advantage that it is easier to recruit test users as they do not need to come to your business on a particular day or at a particular time. A/B testing is also done on live websites, showing two different versions to two sets of real users. A/B testing is frequently used when the designers need feedback on a specific element on a webpage. For example, the designers may need to decide whether they should make a button red or green. This may seem trivial. But different colours can evoke completely different emotions in the user. Choose the wrong one and you could cause users to leave the website before completing the conversion because they fear that clicking on the button will take them someplace they don’t want to go. A/B testing is most insightful when conducted with a large sample of participants. Ideally, upwards of 10,000. Whenever possible, I invite other, non-researcher members of the team to observe research sessions with users and to participate in data analysis. This helps to build empathy with users and increase appreciation of UX research. As briefly mentioned in the insurance company example, quantitative data tells you how something is happening, qualitative data tells you why. So, ideally, UX researchers should use a mix of both quantitative and qualitative methods to get the most accurate insights. Quantitative research methods such as online surveys, remote card sorting and tree testing, or eye tracking can produce large bodies of data. Data analysis software like R, Python, or SPSS can be very useful in these cases. Following the presentation, we brainstorm as a team. What actions could we take to address the newly-discovered pain points? How can we improve the user experience overall? Once the proposed changes have been implemented, more testing is conducted with the users. This is the iterative process that eventually leads to better and better products and services. Importantly, working as a UX researcher is really fun. I get to meet and talk to different people every day. I get to be a part of improving their quality of life. Contributing to the creation of user-centric products and services is stimulating and satisfying. £33,370 in the United Kingdom. It is worth noting that most positions in the UK are contract work, meaning UX researchers can make up to £ 600 per day. I, myself, have a Master of Arts in Politics and International Relations and a Master of Science in Anthropology, Environment, and Development. So I know first-hand that it is possible to make the switch to UX research. And, today, I help other people do the same. Cristina is the lead researcher and instructor at UXSavvy. UXSavvy offers hands-on courses to help you learn all of the techniques discussed in this article. But they also have career consultants who will help you land your first job as a UX researcher. Check their agenda for upcoming events near you.